Iron (Fe) deficiency is one of the common problems in strawberry (Fragaria × ananassa Duch.) growing regions. In vitro screening enables researchers to evaluate genotype performance under several concentrations of Fe in a relatively fast and economical way. Therefore, we evaluated the responses of several genotypes belonging to octoploid Fragaria chiloensis (L.) Mill. and Fragaria virginiana Mill. (the progenitors of cultivated strawberry) against Fe treatments under in vitro conditions. In the first experiment, HM 1, Pigeon Point, CFRA1267 (F. chiloensis subsp. pacifica), and CA1541 (F. chiloensis subsp. chiloensis) were tested with various Fe concentrations (0%, 10%, 15%, 25%, 50%, 65%, 80%, and 100%, where 100% = 27.8 mg L-1 FeSO4.7H2O). Different Fe concentration treatments resulted in differences in plant height, fresh and dry weight, as well as macro- and microelement concentrations among the tested genotypes. In the second experiment, 16 octoploid Fragaria genotypes were tested with 4 Fe concentration treatments (0%, 10%, 50%, and 100%, where 100% = 27.8 mg L-1 FeSO4.7H2O). Iron concentration and genotype interactions were significant for all studied characteristics except sulfur (S) and manganese (Mn) concentrations, and the 16 genotypes responded differentially to varying Fe treatments. The results of these experiments indicated that F. chiloensis and F. virginiana genotypes exhibited considerable variation under different Fe treatments in vitro, and the more resistant genotypes could be utilized to develop new strawberry cultivars with tolerance to low Fe concentrations. Ahmadi H, Bringhurst RS, Voth V (1990). Modes of inheritance of photoperiodism in Fragaria. J Am Soc Hortic Sci 115: 146–52. Aka-Kaçar Y, Çetiner S (1995). 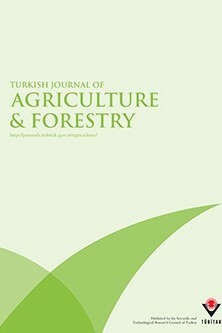 Çilek çeşitlerinin meristem kültürü yöntemi ile çoğaltılmasında gözlenen değişimler. Türkiye II. Ulusal Bahçe Bitkileri Kongresi, Cilt I, 351–355, Adana, Turkey (in Turkish). Álvarez-Fernández A, Paniagua P, Abadía J, Abadía A (2003). Effects of Fe deficiency-chlorosis on yield and fruit quality in peach (Prunus persica L. Batsch). J Agr Food Chem 51: 5738–5744. Álvarez-Fernández A, Abadía J, Abadía A (2006). Iron deficiency, fruit yield and fruit quality. In: Barton LL, Abadia J, editors. Iron Nutrition in Plants and Rizospheric Microorganisms. Dordrecht, The Netherlands: Springer, pp. 437–448. Álvarez-Fernández A, Melgar JC, Abadía J, Abadía A (2011). Effects of moderate and severe iron deficiency chlorosis on fruit yield, appearance and composition in pear (Pyrus communis L.) and peach (Prunus persica (L.) Batsch). Environ Exp Bot 71: 280–286. Arnon DI (1949). Copper enzymes in isolated choloroplast: polyphenoloxidase in Beta vulgaris. Plant Physiol 14: 1–15. Awad F, Römheld V, Marschner H (1994). Effect of root exudates on mobilization in the rhizosphere and uptake of iron by wheat plants. Plant Soil 165: 213–218. Cakmak I, Kalayci M, Kaya Y, Torun AA, Aydin N, Wang Y, Arisoy Z, Erdem H, Yazici A, Gokmen O, Ozturk L, Horst WJ (2010). Biofortification and localization of zinc in wheat grain. J Agr Food Chem 58: 9092–9102. Dale A, Sjulin TM (1990). Few cytoplasm contribute to North American strawberry cultivars. HortScience 25: 1341–1342. DolcetSanjuan R, Mok DWS, Mok MC (1992). Characterization and in vitro selection for iron efficiency in Pyrus and Cydonia. In Vitro Cell Dev-Pl 28: 25–28. Erdal İ, Kepenek K, Kızılgöz İ (2004). Effect of foliar iron applications at different growth stages on iron and some nutrient concentrations in strawberry cultivars. Turk J Agric For 28: 421–427. Hancock JF (1999). Strawberries. Wallingford, UK: CABI Publishing. Hancock JF, Finn CE, Hokanson SC, Luby JJ, Goulart BL, Demchak K, Callow PW, Serce S, Schilder AMC, Hummer KE (2001a). A multistate comparison of native octoploid strawberries from North and South America. J Am Soc Hortic Sci 126: 579–586. Hancock JF, Callow PW, Serce S, Schilder AMC (2001b). Relative performance of strawberry cultivars and native hybrids on fumigated and nonfumigated soil in Michigan. HortScience 36: 136–138. Hancock JF, Callow PW, Serce S, Son PQ (2003). Variation in the horticultural characteristics of native Fragaria virginiana and F. chiloensis from North and South America. J Am Soc Hortic Sci 128: 201–208. Hancock JF, Serce S, Portman CM, Callow PW (2004). Taxonomic variation among North and South American subspecies of Fragaria virginiana Miller and Fragaria chiloensis (L.). Can J Bot 82: 1632–1644. Hancock JF (2006). California public strawberry breeders: a perfect marriage of genetics and culture. HortScience 41: 16–16. Hancock JF, Finn CE, Luby JJ, Dale A, Callow PW, Serce S (2010). Reconstruction of the strawberry, Fragaria × ananassa, using native genotypes of F. virginiana and F. chiloensis. HortScience 45: 1006–1013. Hansen NC, Hopkins BG, Ellsworth JW, Jolley VD, Barton LL, Abadia J (2006). Iron Nutrition in Field Crops. Iron Nutrition in Plants and Rhizospheric Microorganisms. The Netherlands: Springer, pp. 23–59. Horvath A, Sanchez-Sevilla JF, Punelli F, Richard L, SesmeroCarrasco R, Leone A, Hoeefer M, Chartier P, Balsemin E, Barreneche T, Denoyes B (2011). Structured diversity in octoploid strawberry cultivars: importance of the old European germplasm. Ann Appl Biol 159: 358–371. Hummer KE (1991). Fragaria at the National Clonal Germplasm Repository at Corvallis, Oregon. In: Dale A, Luby JJ, editors. The Strawberry into the 21st Century. Portland: Timber Press, pp. 106–107. Jones JB Jr, Wolf B, Mills HA (1991). Plant Analysis Handbook. A Practical Sampling, Preparation, Analysis, and Interpretation Guide. Athens, Georgia, USA: Micro-Macro Publishing. Kafkas E, Silberbush M, Paydas S (2007). Physiological characterization of strawberry cultivars with differential susceptibility iron deficiency. World J Agr Sci 3: 196–203. Luby JJ, Hancock JF, Cameron JS (1991). Expansion of the strawberry germplasm base in North America. In: Dale A, Luby JJ, editors. The Strawberry into the 21st Century. Timber Press, Portland, pp. 66–75. Luby JJ, Hancock JF, Dale A, Serce S (2008). Reconstructing Fragaria ×ananassa utilizing wild F. virginiana and F. chiloensis: inheritance of winter injury, photoperiod sensitivity, fruit size, gender, female fertility and disease resistance in hybrid progenies. Euphytica 163: 57–65. Muleo R, Cinelli F, Viti R (1995). Application of tissue culture on quince rootstock in iron-limiting conditions. J Plant Nutr 18: 91–103. Murashige T, Skoog F (1962). A revised medium for rapid growth and bioassays with tobacco tissue cultures. Physiol Plantarum 15: 473–497. Pestana M, Domingos I, Gama F, Dandlen S, Migue MG, Pinto JC, de Varennes A, Correia PJ (2011). Strawberry recovers from iron chlorosis after foliar application of a grass-clipping extract. Soil Sci Plant Nutr 174: 473–479. Pestana M, Correia PJ, Saavedra T, Gama F, Abadia A, de Varennes A (2012). Development and recovery of iron deficiency by iron resupply to roots or leaves of strawberry plants. Plant Physiol Bioch 53: 1–5. Rombola AD, Tagliavini M (2006). Iron nutrition of fruit tree crops. In: Barton LL, Abadía J, editors. Iron Nutrition in Plants and Rhizospheric Microorganisms. Dordrecht, The Netherlands: Springer, pp. 61–83. SAS Institute Inc. (2005). SAS Users Guide; SAS/STAT, Version 6. SAS Institute Inc., Cary, NC. Schilder AMC, Gillett JM, Byrne JM, Zabadal TJ (2003). First report of Tobacco ringspot virus in table grapes in Michigan. Plant Dis 87: 1149–1149. Serce S, Callow PW, Ho H, Hancock JF (2002). High temperature effects on CO 2 assimilation rate in genotypes of Fragaria × ananassa, F. chiloensis and F. virginiana. J Amer Pomolog Soc 56: 57–62. Serce S, Hancock JF (2002). Screening of strawberry germplasm for resistance to the two-spotted spider mite. HortScience 37: 593–594. Serce S, Hancock JF (2005). The temperature and photoperiod regulation of flowering in Fragaria chiloensis, F. virginiana, and F. × ananassa genotypes. Sci Hortic Amsterdam 103: 167–177. Shaw DV, Famula TR (2005). Complex segregation analysis of dayneutrality in domestic strawberry (Fragaria ×ananassa Duch.). Euphytica 145: 331–338. Smith BJ, Hokanson SC, Lewers KS, Maas JL, Hancock JF, Serce S (2003). Evaluation of native strawberry germplasm for resistance to anthracnose caused by Colletotrichum sp. Phytopathology 93: 79–80. Stephens PA, Widholm JM, Nickell CD (1990). Iron deficiency chlorosis evaluation of soybean with tissue culture. Theor Appl Genet 80: 417–420. Tagliavini M, Rombola AD (2001). Iron deficiency and chlorosis in orchard and vineyard ecosystems. Eur J Agron 15: 71–92. Tangolar SG, Unlu G, Tangolar S, Dasgan Y, Yilmaz N (2008). Use of in vitro method to evaluate some grapevine varieties for tolerance and susceptibility to sodium bicarbonate-induced chlorosis. In Vitro Cell Dev-Pl 44: 233–237. Vose PB (1982). Iron nutrition in plants. A world overview. J Plant Nutr 5: 233–249. Yao SR, Ludy JJ, Hummer KE (2012). Cold hardiness and foliar disease resistance of Northern American and Asian Fragaria. J Amer Pomolog Soc 66: 46–55. Yilmaz GU, Tangolar S, Dasgan HY, Tangolar SG, Yilmaz N (2008). Searching of an in vitro method for evaluation of grapevine responses to iron (Fe) deficiency stress. Eur J Hortic Sci 73: 222–226. Zaiter HZ, Saad I, Nimah M (1993). Yield of iron-sprayed and nonsprayed strawberry cultivars grown on high pH calcareous soil. J Plant Nutr 16: 281–296. Zuo Y, Zhang F (2011). Soil and crop management strategies to prevent iron deficiency in crops. Plant Soil 339: 83–95.